This is a scalable context timeline. 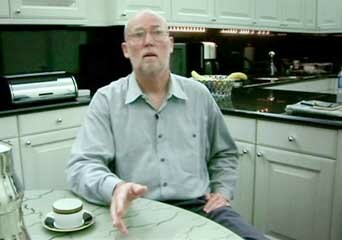 It contains events related to the event April 2001: FBI Translators Learn Al-Qaeda Suicide Pilots Plan to Hit Skyscrapers in US and Europe. You can narrow or broaden the context of this timeline by adjusting the zoom level. The lower the scale, the more relevant the items on average will be, while the higher the scale, the less relevant the items, on average, will be. 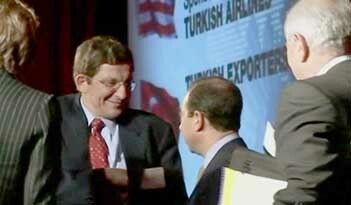 Marc Grossman at an American-Turkish Council meeting in 2005. [Source: Canal+]An unnamed high-ranking State Department official tips off members of a nuclear smuggling ring about a CIA operation to penetrate it, according to FBI translator Sibel Edmonds. Edmonds will later leave the FBI, becoming a whistleblower, and will say she knows this based on telephone conversations she translated. The ring is headed by Pakistani nuclear scientist A. Q. Khan, and includes Pakistan’s ISI intelligence agency, as well as Turkish and Israeli representatives. The official is said to tell a member of the ring that a company the ring wants to do business with, Brewster Jennings & Associates, is a CIA front company. Brewster Jennings & Associates is a front for Valerie Plame Wilson, who will later be outed as a CIA officer in 2003, and possibly other operatives. A group of Turkish agents come to the US on the pretext of researching alternative energy sources and are introduced to Brewster Jennings through a lobby group, the American Turkish Council (ATC). The Turks apparently believe Brewster Jennings are energy consultants and plan to hire them. According to Edmonds, the State Department official finds out about this and contacts a foreign target under FBI surveillance, telling him, “[Y]ou need to stay away from Brewster Jennings because they are a cover for the government.” The FBI target then warns several people about Brewster Jennings, including a person at the ATC and an ISI agent, and Plame Wilson is moved to another operation. Immediately after beginning her job as an FBI translator, Sibel Edmonds encounters a pattern of deliberate failure in her department. Her supervisor, Mike Feghali, allegedly says, “Let the documents pile up so we can show it and say that we need more translators and expand the department.” She claims that if she was not slowing down enough, her supervisor would delete her work. Meanwhile, FBI agents working on the 9/11 investigation would call and ask for urgently needed translations. In January 2002, FBI officials will tell government auditors that translator shortages are resulting in “the accumulation of thousands of hours of audio tapes and pages” of material that has not been translated. [Washington Post, 6/19/2002] After she discloses this in an October 2002 interview with CBS’ 60 Minutes, Senator Charles Grassley (R-IA) says of her charges, “She’s credible and the reason I feel she’s very credible is because people within the FBI have corroborated a lot of her story.” He points out that the speed of such translation might make the difference between an attack succeeding or failing. [CBS News, 10/25/2002; New York Post, 10/26/2002] An investigation by the Justice Department’s Inspector General’s Office (see (July 8, 2004)) will also find Edmonds credible.